This is appalling. 15 years ago, Hindustan Unilever dumped toxic mercury waste in Kodaikanal. The company’s ex-workers were made to handle mercury, which is extremely dangerous, without protective gear. Hundreds of them continue to suffer serious health problems to this day, and have not received any compensation from Unilever. Losing family members, living in perpetual illness and not being able to afford hospital bills, and living with toxic pollution … is this Paul Polman’s idea of a “better life”? 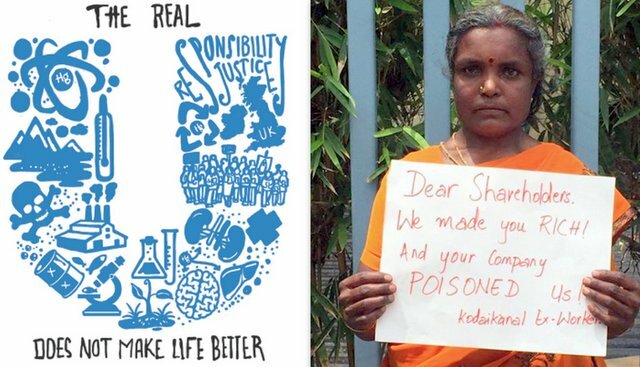 Join the campaign to demand Unilever clean up their mercury mess in Kodaikanal and compensate ex-workers. Esther and her family were exposed to mercury poisoning, along with hundreds of others at Unilever's Kodaikanal thermometer assembly plant. The factory operators did not give its workers any protective equipment or information about the disastrous impact that mercury has on health. Let’s ask him to put his words into practice by asking him to clean up his company’s toxic mess and to compensate the workers who have lost their health and in some cases, their children, to Unilever’s unethical practices. As the global CEO, he has the power and resources to either take unilateral action or pressure Hindustan Unilever - a Unilever subsidy - to take immediate action itself. Sign the petition. Press statement on the viral video "Kodaikanal Won't" here.